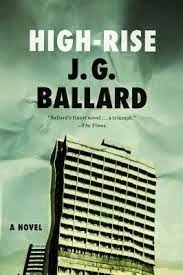 As is almost always the case with Ballard, the structure of High-Rise is shaped like a symphony. Individual elements and motifs repeat, but the overall narrative evolves before the reader’s eyes, the opening steadily transitioned into an ending of entirely different hue. And while certainly it’s possible to view this transition as absurd or unrealistic, it would be to miss Ballard’s underlying premise. For as mimetic as the setting, characters, and plot devices are, the effect of technology in the urban environment has effect on the human psyche in ways we are and are not aware of. One of Ballard’s points certainly that humans were not intended to live in giant concrete boxes, he goes about illustrating it through the mindsets of the people living inside such a construct. Given there are initiatives underway to ban children from airplanes, restaurants that already exist banning children due to the noise they produce, innumerable Western citizens upset by dog owners for similar and other reasons, as well as tensions running high in any dense urban environment for the time a person must spend in such close proximity to others without a glimpse of blue sky or breath of fresh air, Ballard’s points are well-founded. But more than just commentary on modern urbanity, High-Rise is also social commentary on how humans deal with and work in groups. The building’s residents eventually dividing themselves along lines related to which floor they live on and taking on the perceived rights associated with those levels, the fights and inter-floor wars that break out likewise have a grounding in what has been witnessed in reality. From the labor strikes of the Industrial Revolution to the work of the psychologist Philip Zimbardo, Ballard makes the representation that, again, seems absurd given the setting, but nevertheless strikes at the heart of the tensions simmering just below the surface of humanity in our real, modern world. In the end, High-Rise is a fascinatingly disturbing look at humans in a dense, vertical environment. With declining moral strictures, perceived inter-group issues, and dwindling resources, Ballard deconstructs the concept of civilization before the reader’s eyes, the transitory arc of the novel powerfully, visually rendered. Literally delivered in increasingly surreal fashion, figuratively the reader is sucked into the despairing vision laying in dark chambers of the heart of human existence. Violence, petty behavior, malevolence—all are encapsulated in a block of glass and concrete, the weight of those above bearing down on those below. An eerie psychological outlay, the story does not settle comfortably in the brain—behavior and images, lingering long after.